The GNU tools include powerful utilities to collect coverage information. With coverage I know which lines of my code have been executed, which is a very useful test metric. The GNU coverage tools are commonly used for Linux applications. But to my surprise not much for embedded application development, mostly because it requires a few extra steps to have it available? 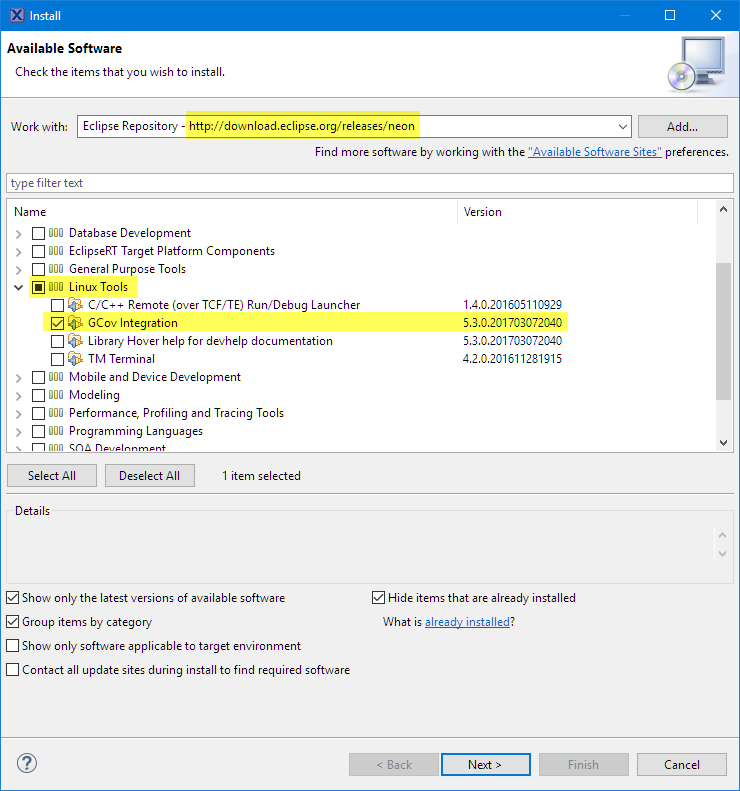 Why not using free and powerful tools for improving software quality? This article explains how to install the GNU gcov tools into the Eclipse IDE. Many Eclipse distributions come with the gcov integrated. 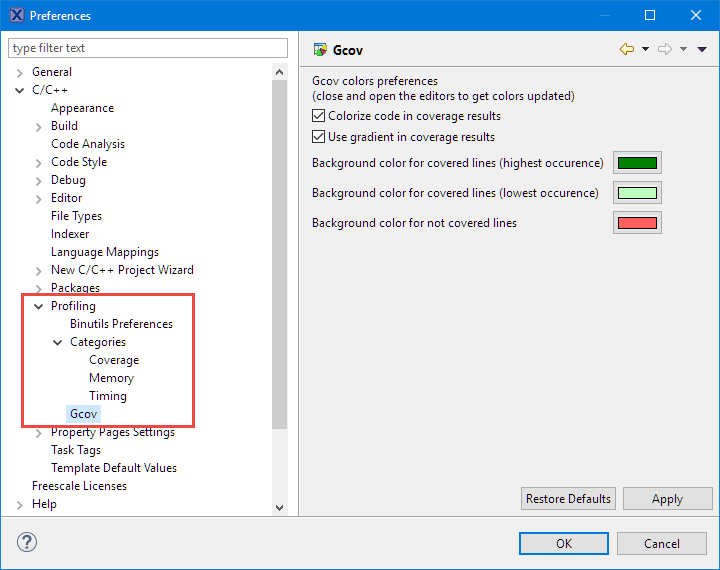 In case your installed Eclipse does not have it installed, the following article describes how to install GNU Coverage tools (gcov) for it. In this tutorial, I’m using the NXP MCUXpresso IDE 10.0.0 (build 344) as an example. This IDE is Eclipse Neon based and uses the ‘GNU Tools for ARM Embedded Processors 5 – Q3 2016’ release. The steps described should work for any other Eclipse or ARM tools version with minor changes. I wrote several articles about using gcov for embedded targets (see the links section at the end of this article). With newer Eclipse versions and GNU tools available, I decided to write an update. 💡 This step is only necessary if the Eclipse IDE does not have the plugins already installed. Under the Linux Tools group, select and install the GCov Integration. Gcov plugin depends on several binutils (binary utilities) (such as gcov, addr2line, c++filt and nm). 💡 Make sure you are using matching binary utilities with your build system/compiler. Mixing binutils with different versions of other tools can have unpredictable side effects. gprof: GNU profiling tool. Not needed for coverage. Listed for completeness or if you want to use profiling too. IF NOT EXIST "%TOOLCHAIN_PATH%\gcov.exe" COPY "%TOOLCHAIN_PATH%\arm-none-eabi-gcov.exe" "%TOOLCHAIN_PATH%\gcov.exe"
IF NOT EXIST "%TOOLCHAIN_PATH%\addr2line.exe" COPY "%TOOLCHAIN_PATH%\arm-none-eabi-addr2line.exe" "%TOOLCHAIN_PATH%\addr2line.exe"
IF NOT EXIST "%TOOLCHAIN_PATH%\nm.exe" COPY "%TOOLCHAIN_PATH%\arm-none-eabi-nm.exe" "%TOOLCHAIN_PATH%\nm.exe"
IF NOT EXIST "%TOOLCHAIN_PATH%\c++filt.exe" COPY "%TOOLCHAIN_PATH%\arm-none-eabi-c++filt.exe" "%TOOLCHAIN_PATH%\c++filt.exe"
IF NOT EXIST "%TOOLCHAIN_PATH%\strings.exe" COPY "%TOOLCHAIN_PATH%\arm-none-eabi-strings.exe" "%TOOLCHAIN_PATH%\strings.exe"
IF NOT EXIST "%TOOLCHAIN_PATH%\gprof.exe" COPY "%TOOLCHAIN_PATH%\arm-none-eabi-gprof.exe" "%TOOLCHAIN_PATH%\gprof.exe"
It checks if the needed tools are present and copies them if needed. It extends the system path to make sure they are found, and then launches the IDE with the new settings. 💡 I’m using that approach with a batch file as I don’t want to change the global system PATH variable (which would be a possibility). Enabling gcov in Eclipse requires the plugins installed plus the matching gcov and binutils for the Eclipse IDE. For more detailed information how coverage works, see the links at the end of this article. In a next article, I’m going to outline how to generate and collect coverage information in Eclipse. 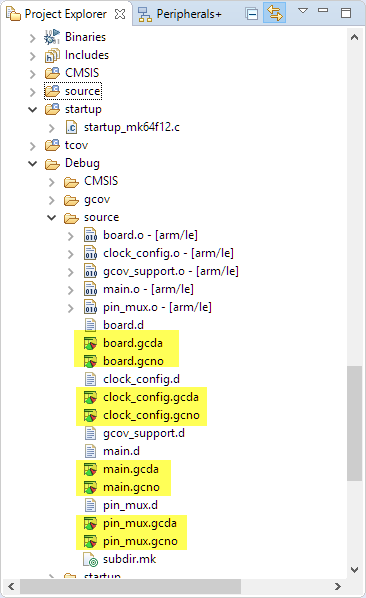 This entry was posted in Building, Debugging, Eclipse, Embedded, gcc, MCUXpresso IDE, NXP, Tips & Tricks, Tutorial and tagged arm gcc, Building, coverage, Debugging, Eclipse, Eclipse Neon, gcov, GNU, gnu gcc, open source projects, software, software project, technology, Tips&Tricks by Erich Styger. Bookmark the permalink. Hi Erich – rather than copying arm-none-eabi-addr2line.exe to addr2line.exe etc. can’t you just change the names/prefixes of the tools under Window > Preferences > C/C++ > Profiling > Binutils Preferences? I considered changing the tool names in the Binutils preferences, but the problem is that this does not allow me to set the names for all the needed tools. So instead doing it in multiple places halfway, I decided to rename all of the tools. And that way it would not be a workspace setting which I would have to repeat for every workspace. OK – I didn’t notice that not all of the relevant tools can be renamed in the GUI. That seems like a bit of an oversight in the Gcov configuration GUI. I understand now why you do it the way that you do. Thanks. First of all, thank you for yours articles. They help a lot. I am trying to have semihosting with a Cortex-M3, Eclipse, GNU Embedded GCC (7-2017-q4 and try with 5_2-2015q4) and the SEGGER J-Link Embedded probe. The “printf” function works well. But the “fopen” function returns 0 and does not create the file on the host. Have you an idea ? It seems that this probe support the file semihosting. Note: I have set the rdimon.specs but not the “newlib-nano” library, because if I set it the “printf” function does not work. Thanks, good to hear that they are useful :-). Yes, the J-Link probes do support semihosting, and it is supported with the GNU Embedded GCC libraries. Make sure you use a recent (not old) J-Link driver (but I think Segger supports file I/O for more than 2 years). It works both with the newlib-nano and the newlib library. Nano is slower but uses less memory. One thought I have is that you should allocate plenty of heap and stack space (several KBytes) if you are using file I/O, same for using printf()). Maybe you were running into a heap/stack overflow? Allocate as much as you can for heap and stack. I have installed the last driver and firmware into the probe. The MCU Embedded Eclipse plugin gives only the option to use newlib-nano (–specs=nano.spec). I have allocated 32KB of heap and 32KB of stack space. If you do not specify the -specs=nano.spec, then it is using the newlib library, so this should work fine. Yes, in this case (only newlib), the printf works fine. But not this line: fopen(“c:\\tmp\\test.txt”, “w”) (the “c:\tmp” directory already exists). The fopen returns 0. Is it possible that it is a problem in the linker script ? I don’t think it is an issue with the linker script, and no special JTAG/SWD pin is needed for semihosting. It works the way the the printf() code calls a breakpoint exception which is catched by the debugger (the debugger has to be attached/connected). “As described, Semihosting is handled by the debugger, in this case GDB/GDB Server. Therefore the actual implementation and available commands as well as the expected target behavior is dependent on the debugger. The J-Link User Guide describes the common available Semihosting commands in general. For GDB Server SYS_RENAME and SYS_REMOVE are disabled for security reasons. You could otherwise, intended or not intended, severely mess up the debugger host. Have you some information about that ? That’s new to me. But it makes sense that they do not allow rename and delete. But these functions are not used by the gcov library, so this does not really matter? Have you tried my test code? That combination only creates files, reads them back and appends data to it. It does not delete or rename files.